My year has been packed full of activities and events, not all linked to photography, hence the lull in posts. I’m back, keen to write again, so in the next few posts I’ll bring you up to date with project activities during 2018. At the end of my last blog I was waiting on some good weather to visit Shady and Miss Sassy (Kiwidinok Siberian Huskies) for a portrait session. It was the last day of our mountain bike trip in Taupo when I got the text announcing Halo (Kiwidinok Siberian Huskies) had given birth to two healthy pups. A little disappointed, no if I’m honest really disappointed I couldn’t make the birth this time yet I would get to see the young family that afternoon on our way home. It’s rise and shine before dawn again, for the Siberian Challenge. Temperatures are nice and cool. The huskies will love it. Another fun day awaits us all. First things first as we arrive in the forest, with the small crew of organizers getting busy setting up the control tent, checking the trails and making sure . . .
Friday August 4th I head up to stay at a house in Waitarere Beach with a group of Central Territories Siberian Husky Club members. Fun group of people, chatting, a few drinks then it’s an early night for all, to be fresh for the pre-dawn start. The setup crew for the Autumn Burn headed into the forest before the main convoy of entrants, so I hooked in behind them . . .
It’s 6.15am, -1 degrees Celsius, the sun creeping up above the horizon as I set up on Linden Estate Winery for the final morning of racing. Frost covers the ground and tops of all the buildings. I’m at an elevated position high above the first section of the course, waiting patiently for the light to come through. Thankful for multiple layers of clothing keeping me warm. As the racing begins I clamber further up to a section, two thirds up the huge hill. Recharged after a rest and some food, I arrive back at Linden Winery Estate round 3pm, just as teams begin arriving. Trailers parked, the dogs get walked, harnesses put on, then tethered by the trailers. Every team I watch shows a very close bond between dogs and musher. An example of this is in the photo of Hayden, Kaino and Bailey. Also spotted is the youngest member taking a well needed nap to re-charge for the late afternoon racing . . . . . Course set up day for Ridge Runners Sled Dog Racing Club Vineyard Classic in Napier, is Friday 28th July. To take part in this, I drive up Thursday night, with my friend Jane tagging along for company. We settle into our unit at the Kiwi Holiday Park, a handy 10 minutes from the venue. In the evening nature treats us to a beautiful double rainbow over the water. Mid-morning Friday I follow Eric, Gaby and the race marshal, Darren Scragg from Australia, to the Linden Estate Winery. As the mushers gather for their meeting I grab my gear and head into the forest to find my first vantage spot on the trail. Raumai Cup Race morning began with drizzle and thick mist hanging over the forest. I arrived early to help set up then headed off to walk the trail. Thankfully it was pretty dry in the sheltered depths of the trees. Leading up to the Raumai Cup race weekend, Ridge Runners Sled Dog Racing Club (RRSDRC) have training runs at the forest, as well as a Mock Race afternoon for mushers, new and seasoned, to come train in race conditions. A training session in mid-May was my first trip to Raumai Forest. Unfortunately for me, I missed the critical right hand turn. 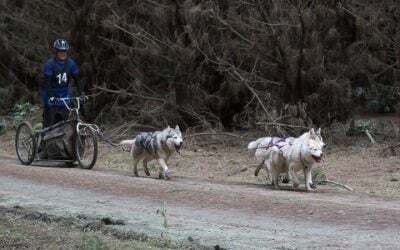 . .
Back in May I was invited to attend a Sled Dog Fundamentals Training weekend held just north of Otaki. It was run by Curt and Fleur Perano, of Underdog NZ, who together have many years of experience running, racing and caring for sled dogs here and overseas. Check out their website for a full bio. This weekend was all about the fundamentals of training and developing a team of dogs . . .
Show time!!! Up until now I’ve only ever been to one dog show in my life, and that was nearly 20 years ago to check out the breeds I was interested in before deciding a husky was the dog for me. Two trips were made pre-birth to orientate myself with the location/environment and get a shot of a very pregnant Spirit. On both these trips I took the chance to enjoy another one of my passions. . .
July last year I re-connected with the Central Territories Siberian Husky Club (CTSHC) and joined them at a training day in Waitarere Forest, north of Levin. Living where I do, this meant being on the road by 5am Saturday morning to reach the meet up point at 6am, then a 10-15 minute drive into the middle of the forest to a small open area. Three teams were there . . Thanks for signing up to follow my adventures in capturing the essence of the Siberian Husky dogs and Sled Dog Racing in NZ. To get started let me fill you in on the back story of how the Siberian Huskies and Sled dog Racing in NZ project came about, combining my passion for the Siberian Huskies and photography.